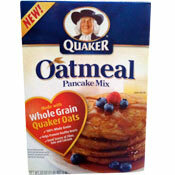 For a pancake mix whose first two ingredients are oat and whole wheat flour - this mix tastes remarkably UN-healthy. In a good way! Though there is no enriched flour, this pancake mix tastes very similar to many of it's less-health-conscious competitors. The box offers two sets of directions for the mix. The featured instructions are for a healthier set of pancakes - using skim milk, egg whites (I used a commercial egg substitute - Egg Beaters) and omit any oil or butter. We opted for this healthier version of pancakes for our testing. *The alternate directions are for a more traditional pancake mix, using whole eggs, 2% milk, and oil. Both directions instruct you to let the mix stand for a few minutes after combining all the ingredients - and this is key as it takes a few minutes for the oat flour to absorb the liquid and get to the proper consistency. I even found that I had to add a little more milk to the batter to thin it out slightly before cooking. The pancakes were fluffy, evenly-browned, and most importantly, they did not taste overly wheat-y or oat-y (the kiss of death to the flavor of most healthy pancake mixes). They just tasted like very good pancakes... nothing extraordinary... just basic good stuff. These pancakes offer 4 grams of fiber per serving, a relatively-low sugar content and good whole grain way to start your day. I'd definitely recommend these for anyone looking for a healthy pancake makeover. The ingredients as listed on the box: oat flour, whole wheat flour, brown sugar, sugar, leavening, dried molasses, salt, hydroxylated soy lecithin, soy flour and reduced iron. Other nutritional concerns: Each serving of two 4-inch pancakes (about 1/3 cup of mix prepared as directed) contains 220 calories, 2 grams total fat (0 grams trans and 0 grams saturated), 31 grams total carbs, 4 grams sugars and 5 grams protein. What do you think of Oatmeal Pancake Mix? I guess no one bought it because it's discontinued. Too bad. I wanted to try it. I agree. This is a very good pancake mix. Very, very good. I am a oat lover and these pancakes were absolutely delicious and easy to prepare. They browned evenly and were fluffy enough for me. I love em! I fix these pancakes with simply the mix and water. I don't worry about the other stuff. It makes them much more healthy. I wash them down with skim milk. It is a good food if you need a good bowel movement. Every time we eat pancakes made with this mix we crash for most of the day. Anybody have a recipe for coffeecake using this product? Also I make very quick one serving waffle. 1/4 cup mix, little less than 1/4 cup milk, 1 egg, 1 tsp. oil. If you plug the waffle iron in when you start you can have a fresh waffle in less than ten minutes. I have it at my house, as well as a Krusteaz Buttermilk Pancake mix. Obviously this mix takes a little more preparation, but in my mind it's not necessarily worth it. They may be slightly healthier, but I find the pancakes always come out flat (by that I mean not-puffy) and I also think that in preparing/eating one cup of this mix vs. one cup of the Krusteaz, I'm much more full after the Krusteaz. Still, not a bad product, they do taste good.